"I had a great experience with my tire purchase with Vulcan Tire, and will be returning..."
There are currently no reviews for this item. Premium performance and quality at an excellent price. Uniform contact patch offers a stable handling. Swept directional pattern improves hydroplane resistance. 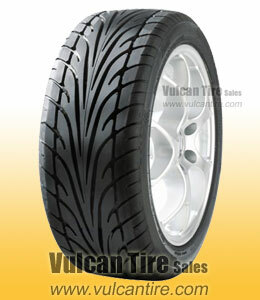 Large tread blocks offer sporty and predictable dry weather traction. Limited, Prorated Lifetime Warranty - If the tire exhibits a defect in materials or workmanship, it will be replaced free of charge during the first 2/32 of an inch of treadwear. After 2/32" of treadwear the tire will be replaced at a discount based on the amount of tread remaining. Tire vibration and out-of-round claims are covered during the first 1/32" of treadwear. Warranties do not cover costs related to shipping or installation. Note: This is just a summery of the manufacturer's warranty, complete warranty terms are available upon request. There are currently no comments available for this item.